Vincent Janssen profile: the hero of the Netherlands’ post-Van Persie era? This is an extract from new football newsletter The Libero, which you can subscribe to here. It all must be quite daunting for Vincent Janssen. Or at least one would think so. Just a year ago, at 20-years-old, he was leading the attack of a mid-table side in the second tier of Dutch football. Now he stands proud as the top-flight’s most prolific goalscorer, impressing for the Netherlands national team, and linked with a move to Arsenal, among other clubs. It is a rise as remarkable as his talent. 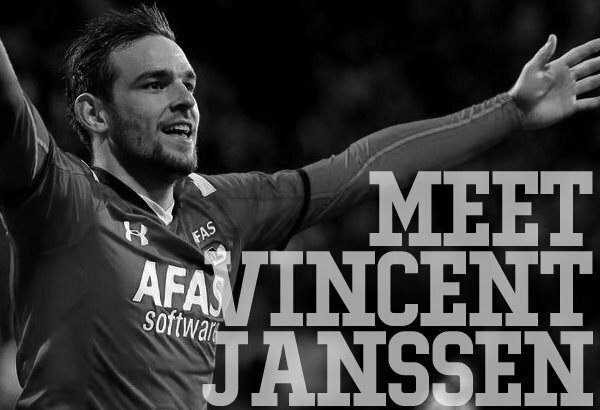 In a few months, Janssen, who scored 27 goals in 34 Eredivisie games this season for AZ, has gone from being hailed as a future star of the Oranje to being the hero of the present. Yet he seems unfazed by it all. After scoring 19 goals in 34 games in the Eerste Divisie for Almere City, he was signed by AZ last summer. He was expected to serve as back-up to Aron Jóhannsson initially, but the latter’s move to Werder Bremen before the start of the season saw him thrust into the starting XI immediately. The Feyenoord academy reject stayed cool and prepared to seize his chance. But after seven weeks of the campaign, Janssen still hadn’t scored. Again, he kept his head up. He never seemed to lack confidence or fear that he wouldn’t soon get off the mark. In his league debut against Ajax, Janssen was lively and bright, just slightly off the pace and misjudging the space and time available to him. He was adapting to a new level, after all, and had been thrown into a team which had lost more than half of its starting players from the previous season. The 21-year-old waited eight weeks to open his account, scoring twice in a 3-1 win over FC Twente. With four goals in the following five games, he had arrived. When the Eredivisie campaign resumed after the winter break, Janssen emerged as a new unstoppable force. In his first 14 league games of 2016, he scored 19 times. A hat-trick against Feyenoord was “sporting revenge” against the team who turned him away as a youngster. Finding the net four times against PEC Zwolle in a 5-1 hammering was the peak of his triumphs. Understandably, Janssen is delighted with the progress he has made: “I’ve really become a target man for the team. My whole game has improved.” After just one season in the top division, it might seem premature to see him as the answer to the country’s striking problems – the man to usurp Klaas-Jan Huntelaar and Robin van Persie – as well as a potential signing for one of Europe’s most prominent teams. But Janssen’s quality is there for all to see: his technique is sound, his movement and positioning are impressive and, wonderfully, he can use both feet – scoring 15 goals with his left and 10 with his right in the league. It was no surprise when he got the call up to the national team in March, earning a runout for the Oranje in the final ten minutes of a 3-2 defeat to France. Four days later, he was in the starting XI at Wembley as Danny Blind’s men took on England. With a goal and an assist in a 2-1 win for the Dutch, he cemented himself as the country’s best centre-forward candidate in what is becoming the post-Huntelaar and Van Persie era. Every year there is an abundance of young players starring in the Eredivisie who face the same perilous decision about making the step up to another league. If it’s too early or they join the wrong team, they risk ruining their careers. Janssen is approaching that conundrum much earlier than expected. The interest in the forward is as concrete as his potential, but it remains unclear if he is truly ready for a bigger challenge. AZ are desperate to keep hold of him, naturally, but if Arsenal or Tottenham act on their reported interest, the Dutch side are in danger of losing their prized asset. Such an opportunity will be difficult to pass up and, while there is a great deal to suggest Janssen is ready, it took him time to get up and running in the Eredivisie – a luxury he will not be guaranteed in England or anywhere else. As tempting as it may be for Janssen to cash in on the reputation he has earned over the past season and maintain his meteoric rise, another year in his homeland will do no harm. He is sure of first-team football and will get more chances with the national team to prove himself at a different level. This is just the beginning for Janssen. Biding his time in the Eredivisie to polish his skills is perhaps the safer decision. From there, he can continue to build a special career. There is a lot more to come from him, that much is obvious. You can follow Peter McVitie on Twitter, where you’ll also find The Libero.